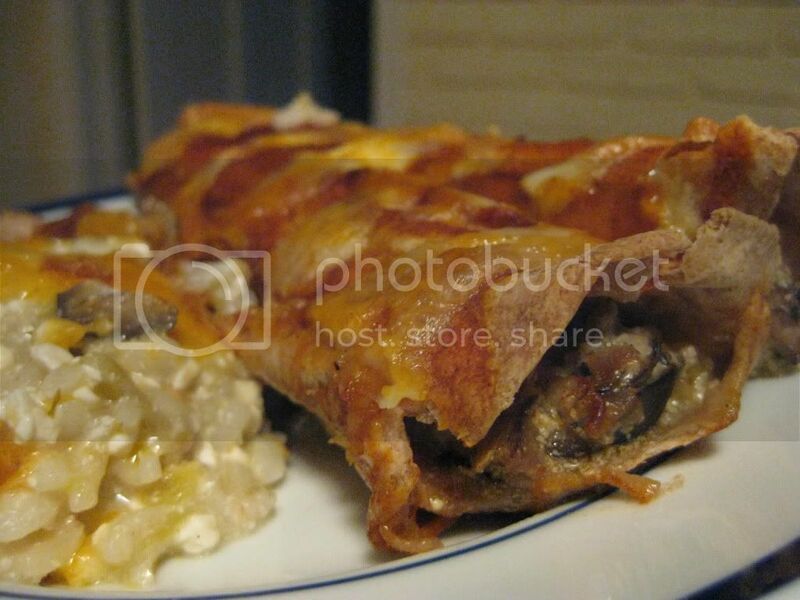 Along side the picture below of (post from Saturday, February 20) is a picture of the enchiladas I created to grace the plate with the Green Chili Rice. 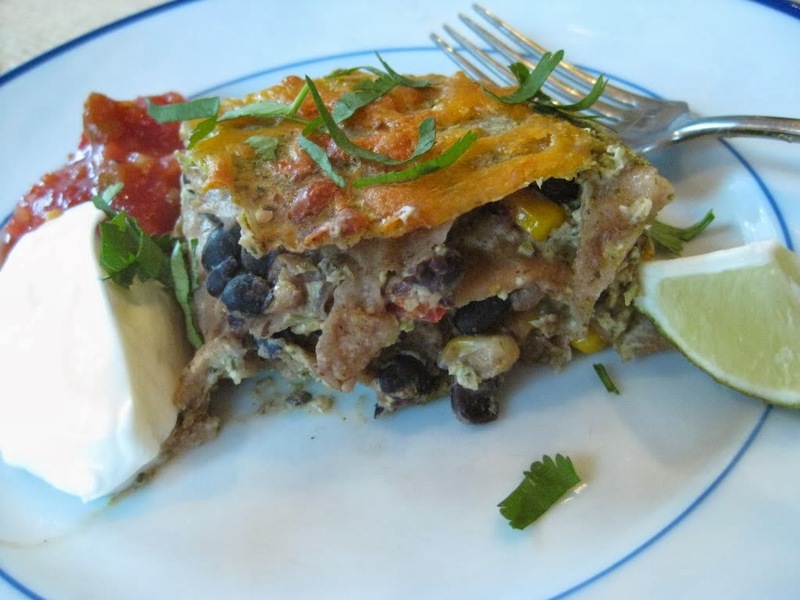 In a shout-out to my friend Lee, who has gone vegan for Lent, these enchiladas can easily be made vegan too. The base for the filling of these enchiladas is mushrooms. I love using mushrooms to replace meat since they have a good earthy flavor profile. Think portabella mushrooms...they make a great "burger" when done up right. Like most children, my boys wouldn't come running to the table if I announced we were having mushrooms. But "portabellas" or "porcinis" may sound exotic to little ears, or you can just say they this recipe is for enchililadas, and leave it to that. In a large skillet over medium high heat, heat the olive oil. Add the onion and garlic and cook for about 5 minutes, or until the onions are translucent. Add the mushrooms, olives and yellow pepper to the skillet and cook for 5 minutes, or until the mushrooms have softened. Remove from the heat and add the oregano, cumin, salt, pepper and sour cream (or silken tofu). Mix well. Place 1/8 of the vegetable mixture on the end of a tortilla and roll up, placing in a 9x13 glass dish seem side down. Repeat 7 times. Pour enchilada sauce over all the top of the enchiladas, and top with cheese, if using. Bake 20-30 minutes or until the edges of the tortilla brown slightly. We're about day 4 into my new (temporary?) vegetarian lifestyle and I have to say I'm having a blast. Really. It has been so fun to have a new angle with which to research recipes, try recipes and do some new cooking. This recipe is hardly new though. I recall vividly the first time I tasted it, at my friend Noelle's house when I was in grade school. Noelle's dad is a true gourmet, and when he made this rice dish for us, I was hooked. I had forgotten about the recipe until I recently ran across an old recipe box in a dark recess of my kitchen. Remember recipe boxes? I haven't used mine in many years, so when I found Noelle's dad's recipe for Green Chili Rice, I was thrilled. The original recipe called for a stick of butter, lots of full-fat sour cream and cheese and the like. It also used white rice. I replaced the butter with a mere 2 teaspoons of olive oil (the butter *really* wasn't necessary with all the cheese) and the full-fat cottage cheese, sour cream, and cheddar cheese with lightened versions. I wasn't sure what all my changes would do to the taste, but let me tell you, I was transported back to the 5th grade as soon as I tasted this dish. Maybe I need to find my old Swatch Watch and neon telephone cord belt and really get into the 5th grade mind set. In a medium skillet, heat the olive oil over medium high heat. Add the onion and garlic and cook for about 5 minutes, or until the onion is translucent. While the onion and garlic are cooking, in a medium bowl mix the rice, sour cream, cottage cheese, salt, pepper and green chilis. Add the onion and garlic once cooked. Pour into a 9x9 glass baking dish. Sprinkle cheddar cheese on top. Bake for 30 minutes or until bubbly and the cheese begins to brown a bit. Happy Fat Tuesday to you. Need a festive dish that isn't so fat but still tastes decadent and is great for a celebration? Try this Shrimp Ceviche. Unlike a *true* ceviche, the shrimp is cooked and mixed with wonderful melange of goodness. "But SPC," you may be thinking, "isn't ceviche more of a summer dish?" Yes. Which is exactly why it fits the bill for a cold winter celebration or everyday meal. It tastes like summer. So close your eyes and eat some, and dream of the warmer weather to come. Cook and peel the shrimp if necessary and cut into 1/2 pieces. Mix with the lime and orange juice and refrigerate for at least 4 hours, or up to 8. Mix the tomato, onion, cilantro, and chili. Combine with the shrimp mixture. Immediately before serving, dice and add the avocado and cucumber. Makes about 6 cups of ceviche. Side note: I am going to particularly celebrate Fat Tuesday this year, because as you may have read, tomorrow I begin our family's vegetarian challenge. No shrimp ceviche, no bacon, heck, not even a smidge of anything that was once breathing. Hope you and yours enjoy a warm (in your heart, if not in your climate) Valentine's Day! This recipe surprised me. I mean, I never set out to make things that my kids won’t eat, but there are certain dishes that I create that are sort of “a wing and a prayer” type meal. Using canned wild Salmon that has been de-boned and de-skinned makes this recipe extra fast. Side note: if you aren't that keen on Salmon, the fresh and bold flavors of the other ingredients make this a very non-fishy Salmon recipe (does that even make sense?). Mix all ingredients, except mayonnaise, reserving 1 teaspoon of lime juice for another use. Add 1 tablespoon of mayonnaise and test the mixture. Can you form a patty with it? Is it too crumbly? If it is too crumbly, add another tablespoon of mayonnaise. Form 4-6 patties and place on a cookie sheet. Broil for 5-6 minutes or until browned. Flip and repeat. While the burgers are broiling, mix remaining 2-3 tablespoons of mayonnaise with the reserved lime juice to use as a topping on the burgers. Serve each burger with a dollop of lime mayonnaise and some cilantro. We used pitas, and the boys gobbled up these burgers quicker than you can say, "really? you like them?" Have you heard of Pine Mouth? I certainly hadn't until a friend mentioned that she had eaten some pine nuts and had a metallic/bitter taste in her mouth for days afterwards. Weeks later, a second friend mentioned the same thing. Apparently, the initial concern was that pine nuts from China may be suspect. There was concern that the lack of a strong food safety track record may have been to blame for imported Chinese pine nuts' ability to cause an aftertaste in your mouth. But reports now continue that pine nuts from other parts of the world have caused the same reaction. I have successfully dodged the pine nut mouth epidemic, but I have to be honest with you, after reading about pine mouth and talking to my friends, I will think twice before eating pine nuts again. R and I were in Target last week and picked up some Star Wars Valentines. The Valentine Heart wreath is up on our front door and today is the first day of February. So how 'bout some heart-shaped muffins that also do your heart well? These muffins have some real heart-healthy ingredients. Ground flax seed, pomegranate juice and whole wheat flour grace these healthful little goodies. Add to that some shredded carrots and apple and you have a health bonanza in every bite. An aside: I was hoping that by using pomegranate juice I would not only boost the nutritional value of the muffins but create a pink-ish hue for the muffins. No such luck. It would take a *lot* of juice to alter the color, I discovered. But non-pink or pink, these heart-y muffins are delicious, healthy, and good for you no matter what shape you make them. In a large bowl, mix the dry ingredients. In a separate bowl, mix the wet ingredients. Pour the wet ingredients into the dry, stirring to fully incorporate, but being careful not to overmix. Shread the carrots and apples, using a food processor. Add to the muffin mix. Pour into lined muffin pans. Bake for 20-25 minutes, or until a toothpick inserted into the middle of the muffin comes out clean.